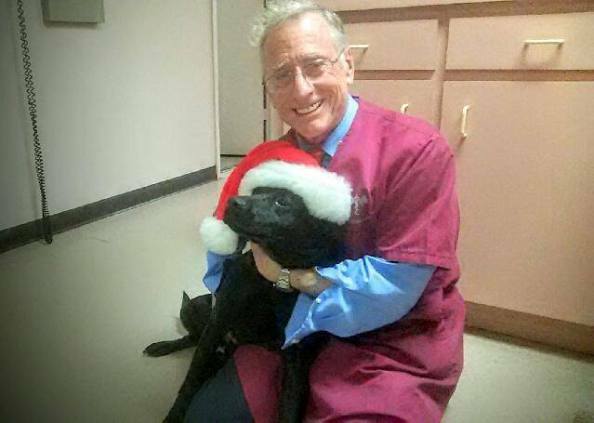 The holidays just got a lot merrier for Paul Gartenberg, a veterinarian in Brandenton, Fla., and his Black Lab mix, Padi. In June, Padi bit off part of a 4-year-old’s ear when the boy lunged at the dog, who was hiding under a desk in the office of his owner, veterinarian Paul Gartenberg. Padi, who’d been rescued from an abusive situation, often stayed under the desk in his “safe spot,” Dr. Gartenberg told the Associated Press. Even so, Manatee County Animal Services took Padi and determined he would have to euthanized under Florida’s “Damage by Dogs” statute. The decision was upheld by a county hearing officer. Padi’s case sparked global outrage. The Free Padi Facebook community currently has more than 27,400 members. According to the Damage by Dogs law, if a dog who has not been labeled as “dangerous” bites someone deeply enough to require stitches or reconstructive surgery — even if that someone provoked the dog or happens to be a murderous intruder inside your home — the dog must be confiscated and euthanized. That’s right — the state that was first to enact a controversial “Stand Your Ground” law, which protects humans who defend themselves against real or perceived threats, does not extend that protection to most dogs. Today Judge Andrew Owens decided the law is unconstitutional, and set Padi free, clearing the dog “of any type of death sentence, for lack of a better word,” Charles Britt, the attorney for Gartenberg, told WWSB. “(The statute) results in an unconstitutional delegation of discretion in animal control authorities insofar as the statute provides animal control authorities no guided authority to select the severity of consequences for a dog’s actions,” the judge ruled, according to the Brandenton Herald. Florida Rep. Greg Steube also thinks the law is unfair, and has introduced a bill (HB91) that would save the lives of dogs who bite only to protect themselves or their family members, or bite someone who is trespassing. If passed, the new law would allow all pet parents due process, giving them the opportunity to explain the circumstances of a biting incident. A hearing officer would then decide whether the dog should be euthanized. The bill has been passed unanimously by two committees so far. Steube told 10 News he hopes it makes its way to Gov. Rick Scott’s desk by January. In the meantime, Manatee County Animal Services has been ordered to no longer enforce the Damage by Dogs statute and to close any pending cases in which the law was said to have been broken.